We offer many items for use with turntables. Please choose from the menu below. Stroboscope Shirt The world's first wearable turntable speed testing tool. Works great as a shirt, or fold it up and place it on your turntable to see if it's spinning at 33.3 or 45 RPM. Works in both 50Hz and 60Hz systems. Frequency Sweep LP More than just frequency sweeps, this famous LP contains multiple tracks to assist in turntable & system setup. Ruby Heart Cartridge Made to our specifications by Benz/Micro in Switzerland, using Cardas copper or silver wire, with a body made from Oregon Coast myrtle wood. Phono Box Adapt your turntable with a DIN output (standard 5 pin DIN or NAIM) to RCA. DIN Plugs Male & Female DIN connectors. Cartridge Clips Brass clips plated with silver, rhodium/silver, or gold. 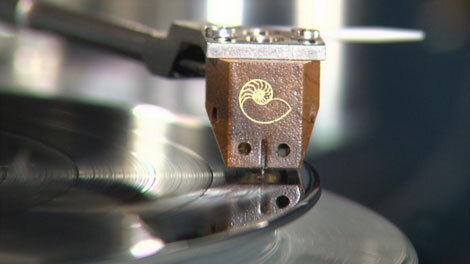 Headshell Leads Our cartridge clips terminated onto 33AWG tonearm wire. 34AWG Clear Tonearm Wire Our lightest, most flexible tonearm wire ever. 33AWG Tonearm Wire Our original premium tonearm wire. Phono cables We have several high performance phono cables, typically terminated from DIN to RCA, or RCA to RCA.